This fall’s flight test on the variable stability F-16 at Edwards Air Force Base has sparked interest with Aviation Week, commenting on the potential for the L1 control system to be used as a failsafe system for aircraft. Aviation Week Intelligent Network has featured the article on their webpage: “Adaptive Safety System Flies On Variable Stability F-16”. Testing of an adaptive flight controller that could enable pilots to save a damaged or out-of-control aircraft is underway on an F-16 at Edwards AFB, California, as a critical step toward eventual certification of the system for piloted and unmanned aircraft. The first flight of the L1 adaptive control law on Calspan’s variable stability inflight simulator test aircraft (VISTA) F-16 took place at Edwards on Aug. 26 following a week of ground tests. The two-week campaign is expected to cover 10 2-hr. flights, which will test the ability of the L1 system to safely control the aircraft over a wide range of flight conditions and simulated failures. Developed by researchers from the Advanced Controls Research Lab at the University of Illinois at UrbanaChampaign, the L1 is designed as a backup safety flight control system (FCS) to augment a standard FCS in a conventional aircraft, or as the main control system for an unmanned aircraft. The L1 automatically intervenes if the aircraft has control problems, immediately reconfiguring the FCS to compensate for degraded flying qualities from mechanical failures, miss-trimming or battle damage. Advanced testing of the L1 comes as loss-of-control inflight (LOC-I) air transport accidents have escalated; they are now the cause of the greatest number of fatalities. International Air Transport Association records list 31 LOC-I accidents in 2011-15, 30 of which involved fatalities—an average of six loss-of-control accidents per year. The LOC-1 problem is also widespread in general aviation. And according to the National Transportation Safety Board, it resulted in 1,210 deaths in the U.S. alone in 2008-14. The L1 is designed to provide safe, predictable, reliable and repeatable responses, freeing pilots to deal with the emergency and compensating for reduced performance. The system works in real time to predict transient behavior by estimating an aggregate of uncertainties, rather than relying on the selection of preprogrammed gains, as do most other adaptive control systems. The L1 controller includes a state predictor and a fast estimation law, which together approximate the dynamics of the aircraft to gauge the uncertainties. These estimates are provided as input to a bandwidth-limited filter that generates a control signal to the FCS. The evaluation is the second time the L1 controller has flown on a manned aircraft; it follows an initial phase conducted at Edwards in 2015 that used Calspan’s specially modified variable stability Learjet 25. Led by the U.S. Air Force Test Pilots School (TPS), the initial evaluation investigated the ability of the control system to maintain nominal aircraft handling qualities and prevent unfavorable aircraft-pilot interactions in the presence of aircraft failures such as changes in aerodynamics, loss-of-control effectiveness and coupling between control channels. 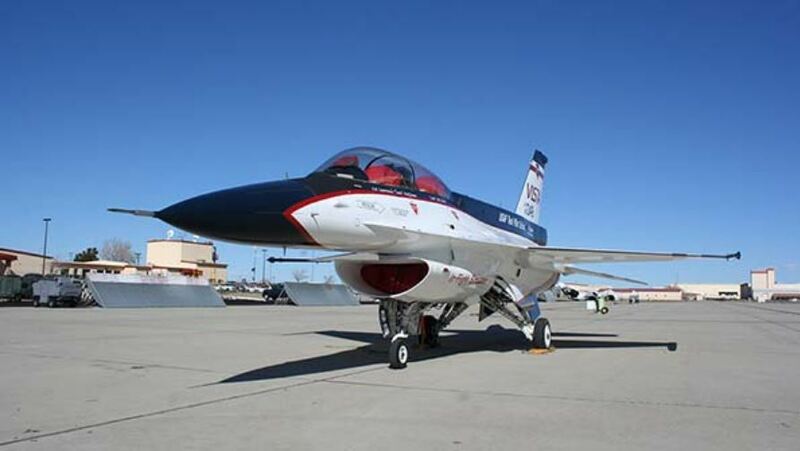 The new tests, which also involve the TPS, will study the system’s performance in the more dynamically challenging environment provided by the VISTA F-16. Additional failure configurations will be vetted on the more maneuverable fighter aircraft to demonstrate the ability of the control law to compensate for off-nominal dynamics, actuator failures and other types of uncertainties not flown in 2015. Like the Learjet, the VISTA is configured with a variable stability simulator (VSS) computer that simulates off-nominal dynamics and aircraft failures. If a problem is encountered, the VSS locks out the research flight control system and gives control back to the safety pilot. Initial production applications of the L1 are likely to be on unmanned systems, says Hovakimyan. The L1 was flown for the first time in 2006 in the Rascal unmanned aerial vehicle at the Naval Postgraduate School and again in 2009 when NASA evaluated the controller on the AirSTAR Dynamically Scaled Generic Transport Model research aircraft. Making changes to existing large aircraft programs is hard, but the newly emerging industries should be open to this, Hovakimyan says. “We’d like to see the greenlight to go for certification of the L1 as the basic FCS of UAV,” she adds.